Jae Yoo’s family is moving, but because she wants to remain studying in her city, she has to find a place to stay. And what’s better that the boarding house that is rumored to be full of hot guys? But to get a room there, she has to do a favor to a friend: going out with a guy who turns out to be ugly and not her type at all. Because she ends up dumping him not long after, she pisses off Ji Hu, the ugly guy’s best friend, who turns out to be the son of the lady who runs the boardinghouse and the gang leader of the school. Now she has finally managed to live surrounded by handsome guys, why is this Ji Hun idiot making her feel like she is in hell instead? 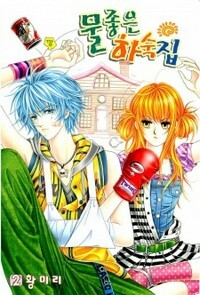 Hwang Mi Ri can have some manhwa looking decently good, but other are just… meh. And this one falls under the later category as it seems she didn’t put a lot of effort on it. Plus the thing about the white eyelashes bothers me to no end. Or maybe is not that bad and i’m prejudiced because the story was bad. Boring, they are just there. They are not capable of making you feel what you are supposed to feel. For example, Ji Hun’s troubled story with his ex girlfriend does have the potential to make you feel bad for him, but it doesn’t feel true. Jae Yoo and Ji Hun have no chemistry whatsoever as well. Their relationship doesn’t evolve at all. You end up thinking she is better off with the other two guys (one of them appearing near the end), with whom she has way more chemistry. And I’ve felt the same way with some of other Hwang Mi Ri’s works as well and I think it’s due to the fact that she draws the female lead interacting more with the other guys rather than with the actual male lead, which I can’t understand. The female lead in particular is dumb, but her dumbness is overshadowed by the “unfeelingness” of the story. Is that a word? Mm… there was that time… no. Also… maybe when… better not. Oh, never mind. Oh, well, the end is kinda original, but by the time you get there, you couldn’t care less. So, as I said, this story does make you feel something: boredom. Seriously, no feelings, no chemistry between the leads. The plot in this story comes as follows: misunderstanding, misunderstanding, misunderstanding… All of them pointless. You get the gist? 2 out of 10 just for the sake of it. I am tired of Hwang Mi Ri’s works to be honest! I really liked reading her manhwa originally but after reading about 5 or so, I can predict who the protagonist will end up with. Plus, her characterization tends to be pretty identical so the manhwa isn’t that interesting in this area either. I like Soonkki’s works though. A scanlation group called Naver, has been scanlating one of her works called Cheese in the Trap and I think that it’s one of the best out there. You are totally right. Her works are very similar. To be honest, I read “Boarding House of Hunks” after reading some of her other works, so I was fed up already. I guess that’s why my thoughts on this one are so negative, but I don’t think I’d have thought otherwise anyway… I did like “The Moment When a Fox Becomes a Wolf”. For a Hwang Mi Ri’s work it’s a little more original and the interaction between the characters is not that bad. I will be reviewing that one soon, so I hope you’ll read it seeing that you like my reviews 🙂 I’m so happy about that, really :3 I also love hearing different opinions, so thanks for your comments! Do read it! It’s one of the best manhwa I have ever read and it’s such a pity that most people haven’t heard of it. The first Hwang Mi Ri work that I read was about this delinquent female banchou and the story progressed in traditional Mi Ri fashion. At the time, thought it was the best ever but I read a couple of others and I started seeing the pattern. It was always going to be the dark-haired psycho. Plus, the female protagonists look waaay similar. Thankfully, all Korean manhwa isn’t as one-dimensional. haha are you studying marketing maybe?